Let’s make your mornings just a little more enjoyable with Chia Pudding Breakfast Jars, shall we? This simple treat can be prepped ahead of time, so you can grab and go. Chia seeds are packed with nutrition, and can be incorporated in so many fun and creative ways. Chia seeds are typically used as a thickening product because they create a gel-like substance when combined with liquids. They contain protein, omega-3 fatty acids, and fiber. Chia seeds are great to add to oatmeal, smoothies, puddings, and cereals. They contain 5 grams of omega-3 fatty acids, which play an important role in energy production and inflammation reduction. Two tablespoons of this super seed contains 3 grams of plant-based protein. They also provide a healthy dose of fiber, manganese, phosphorous, magnesium, calcium, and iron. You can typically find them in a bag sold in your local grocery store. If you need help with eating breakfast, like many of our clients do, this recipe is for you. Breakfast can be an essential component in regulating your metabolism and sets the stage for what else you might be eating during the day. Research has found that those who regularly ate breakfast have improved performance during the day. If you’re not currently a breakfast person, start by drinking a glass of water in the morning. Then increase to adding something small with the water, like a piece of fruit or 1 serving of mixed nuts. 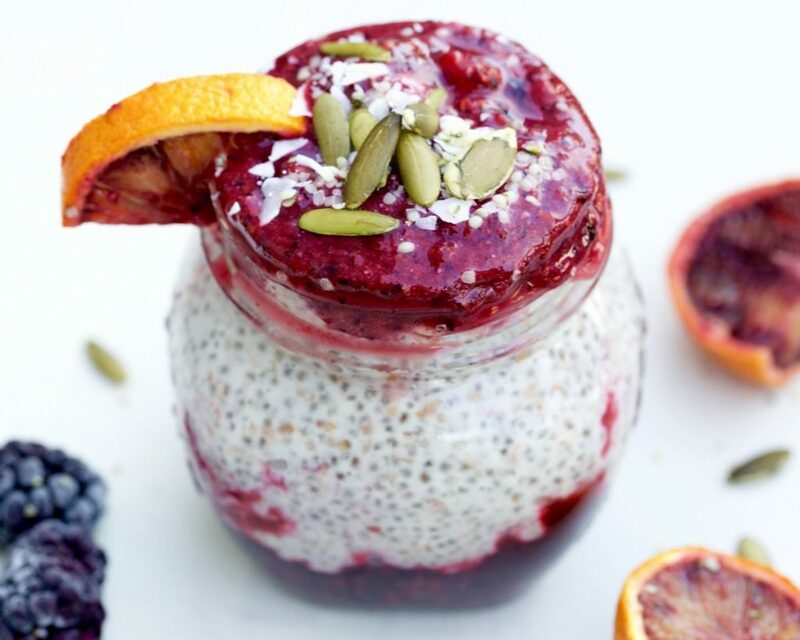 Slowly work your way up until your morning appetite is down to try this Chia Pudding Breakfast Jar! Let’s get started on our recipe! Whip this up by mixing the almond milk with the maple syrup and vanilla in a large bowl, glass, or jar. 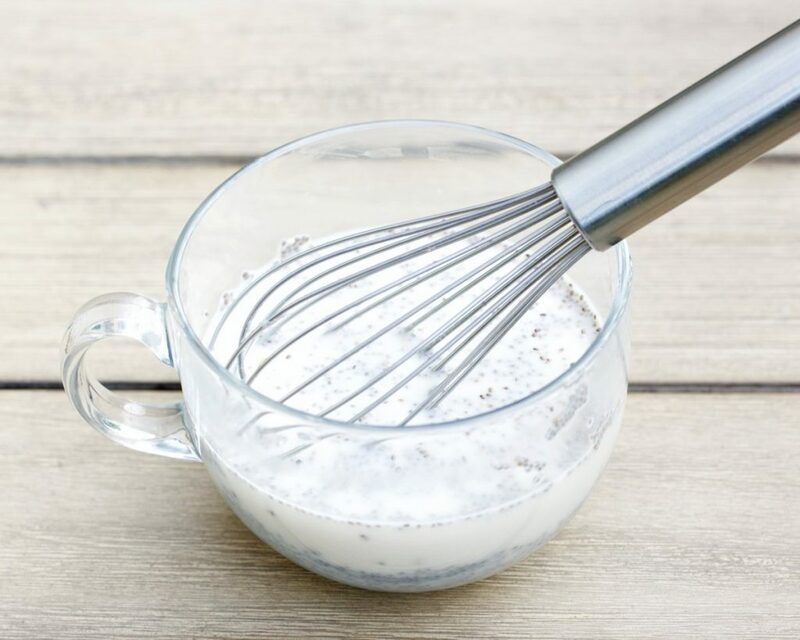 Then whisk in the chia seeds. Mix well until the chia seeds are evenly dispersed. Place this in the fridge and let it sit overnight. When ready, mix it all together one more time with a spoon. Now let’s get ready to assemble our breakfast jar! Start by adding the blackberries to the bottom of your jar, and mash them up with a fork. Then add the chia pudding. Layer with your favorite smoothie blend. For this recipe, we blended blood orange, berries, and almond milk. Top with pumpkin seeds, coconut flakes, and hemp seeds for a hearty start to your day! Chia seeds are super versatile like in this Chia Pudding Breakfast Jar or in our other recipes like: 3 Ingredient Berry Chia Seed Jam, Mango Chia Seed Pudding, and Coconut Chia Granola Cereal. 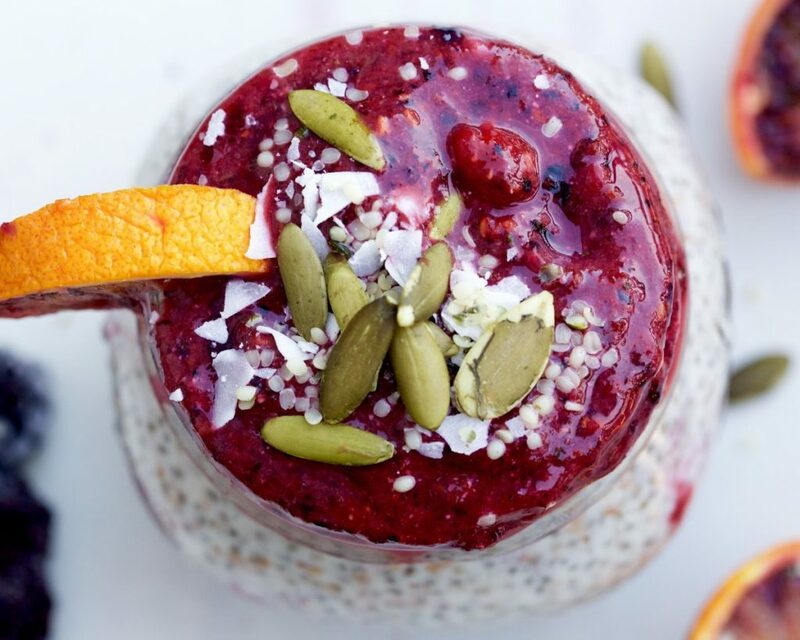 What are your favorite chia pudding recipes? Shoot us a comment below! Top with pumpkin seeds, coconut flakes, and hemp seeds for a hearty start to your day! do your recipes come with nutrition information? hey! we don’t provide nutrient calculations because they’re very time consuming to do in an accurate way. sorry! This looks so delicious!! Do you know how many calories are in this? Or is there a good way to calculate the calories? This looks great! What size jar do you need to fit this recipe? One that’s at least 12 ounces!